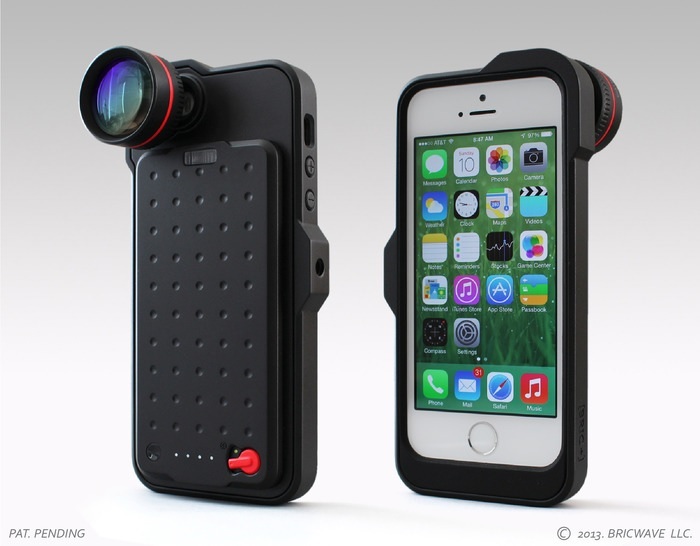 Bric+ Case for iPhone 5 / 5S Aims to Provide Users with 2.5X Extended Battery Time | OhGizmo! By Hammad Saleem on 12/16/13 • Leave a comment! Those of you who’re not happy with the battery time of your iPhone 5 or iPhone 5S should give Bric+ Case a look, which is compatible with both the iPhone 5 and iPhone 5S. The case is manufactured by Sudong Cho and Bricwave and aims to provide an extended battery life, almost 2.5 times more than the original battery, thanks to the Li-ion built into the protective case. According to the company, the case can provide up to 25 hours of talk time compared to 10 hours on the original iPhone 5. Additionally, the case also comes with a Lens at the back, giving users 3.5 times optical zoom to help you improve your photography capabilities. The project is currently on Kickstarter with a $65000 funding goal, before they can start production of the case. If you think this is a good idea, head over to Kickstarter and make the pledge. ← Baby Seat With iPad Stand: Genius Idea Or Worst Baby Brainwashing Garbage Evar?